One of the few distilleries to operate its own malting floor and one of two distilleries on Orkney Island, Highland Park has been making great whisky since 1826 (they claim longer but who doesn’t?). 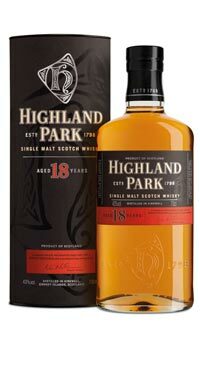 Highland Park is well-respected for being an all-rounder in style offering some of the coastal character typical of the Islands, Islay, and coastal Highland whiskys, while also offering plenty of juicy fruit for Speyside fans to sink their teeth into. Highland Park has something to offer for a wide range of palates and therefore has a place in any whisky enthusiast’s cupboard. Natural rubber, black liquorice, apple pie, cut grass, and gentle sea smoke are the dominant traits on the nose but there’s more depth than can be listed. The palate is middleweight and sappy with honey, marmalade, baking spices and a big surge of sea brine and peat that finishes with long gentle whiffs of lemon drops and smoke.